Started in 1995, Solid Gold Northland grew out of our desire to bring healthy foods to pets, foods that are free of chemicals, allergens and perservatives. It is our passion to bring you the healthiest products from companies who are passionate about pets and nutrition, and who are leaders in natural products and foods for pets. We are very excited to announce our new product lines of raw foods. Ask for these healthy foods at your favorite Solid Gold Northland retailer locations in Minnesota, Iowa, Nebraska, North Dakota, South Dakota and parts of Wisconsin. Vital Essentials for dogs and cats provides the “Alpha” diet, raw meat, meaty bones and essential whole organs meats that dogs instinctively like and need to thrive. 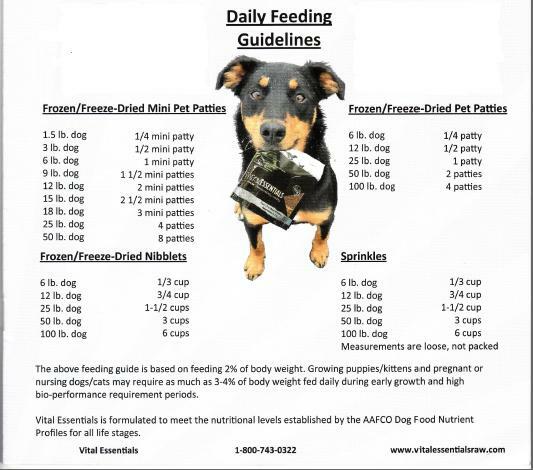 Vital Essentials comes in nibblets, mini-patties and patties, which are available in raw and freeze-dried form. Vital Essentials is now in stock from Solid Gold Northland. Raw Bistro is a local Minnesota company that believes in nutrition as nature intended. They specialize in dehydrated dog treats, calling them treats so healthy they shouldn’t be called treats. Raw Bistro, believes in the power of the raw diet (available September 2011) to help pets live their healthiest and happiest lives and is commited to the health of our shared planet. Steve’s Real Food will be coming to Solid Gold Northland in August 2011. Their products contain the perfect balance of meat and vegetables to make giving your pet a raw food diet easy and affordable. A leader in raw food for pets and offers as easy to feed as kibble frozen 1/4 inch cubes. Fresh raw food, is an extremely healthy addition to your pet’s diet. The chart below is a guide for full feeding of Vital Essentials. You can use the chart below to also calculate partial feeding. 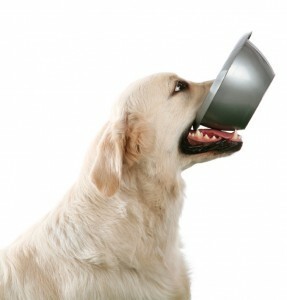 Example: You want to feed your pet 1/4 of a meal Vital Essential. Reduce the meals kibble by 1/4, locate your pets needs on the chart and add 1/4 of that amount to the meal. It’s that easy to add fresh food to your pets meal! To find a Solid Gold Northland retail partner near you, click here.